I recently finished reading Stealing From God, by Frank Turek. This was not a book to sit down and read in one sitting, so I took it in much smaller bites -- ten minutes here, fifteen there. It was great to think about it in between those reading sessions. If you think atheists have reason, evidence, and science on their side, think again! Award-winning author Dr. Frank Turek (I Don’t Have Enough Faith to be an Atheist) will show you how atheists steal reason, evidence, science, and other arguments from God in trying to make their case for atheism. If that sounds contradictory, it’s because it is! Atheists can’t make their case without appealing to realities only theism can explain. 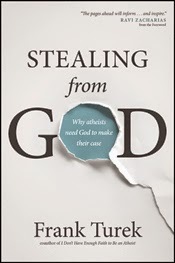 In an engaging and memorable way, Stealing from God exposes these intellectual crimes atheists are committing and then provides four powerful reasons for why Christianity is true. What would you become if you got everything you wanted every time? If that happened to me, I would become even more selfish than I already am. Self-centeredness grows the more it's fed. Why God would let bad things happen to those who believe in him isn't the only topic in the book, of course. It's the one that stands out to me at the moment though. As I read the book, I really loved the chapters on Science (Science Doesn't Say Anything, Scientists Do) and The Four-Point Case for Mere Christianity. My teens are going to be picking this book up and reading it as well. If they don't, I'll be assigning it to them.